Does Autumn inspire you to purge, clean up, get your office organized…??? For many of us, it does. The challenge is finding the time!! Why not apply this philosophy to your business? 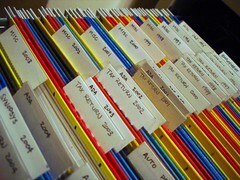 How clean are your files: electronic and hard copy? When is the last time you verified your customer’s contact information? Are your employees’ addresses up-to-date? Your website(s) should be tested for operational links, correct item codes, up-to-date graphics, etc. Make an investment in cleanup today…it’ll save you a headache tomorrow. This entry was posted in Blog and tagged Business, business tip, organization, Purge, Social Security Administration. Bookmark the permalink.